Dejan Lovren may not have stated outright that Liverpool could go unbeaten this season in the Premier League, as has been widely reported, but Thursday night ensured such talk became redundant. Liverpool will not follow Arsenal’s 2004 ‘Invincibles’ after suffering a 2-1 defeat to Manchester City at the Etihad Stadium. Hyped to the maximum as a potential title decider – a ridiculous statement to make when we have barely begun January – Liverpool had the opportunity to move ten points clear of Pep Guardiola’s defending champions with a win in Manchester and put themselves in a commanding position in the Premier League title race. Unfortunately, the reverse happened, with Leroy Sané’s winner reducing Liverpool’s gap at the top of the table to four points in what was an engrossing encounter between two of the titans in English football. The match constantly ebbed and flowed, with Manchester City and Liverpool taking turns to assert slight supremacy in a fixture that was always in the balance, right up to the goalmouth scrambles in the final few minutes as City held onto what could be a vital victory. A ten point lead for Liverpool would not have ended City’s hopes of defending their crown, but life would have become extremely complicated for the title holders, requiring a near-perfect run until the end of the season and for Liverpool to suffer a full-blown crisis of their own. Consequently, priorities could have shifted to the Champions League with such an effort required to reclaim successive Premier League titles. Now all Pep needs is a small wobble from Jürgen Klopp’s side and the title would be within reach for the blue half of Manchester once again. Twenty-one games in, Liverpool have not looked close to collapsing as they have continued to improve throughout the campaign. Early struggles in midfield and going forward were protected by the unveiling of a truly brilliant defence that has still only conceded ten league goals all season. Liverpool arguably did encounter their own period of struggle against Chelsea, Napoli, Manchester City and Huddersfield Town in late September and early October, and were hardly brilliant against Red Star Belgrade, Fulham, Paris Saint-Germain and Everton, but did enough to keep pace with a relentless City side. 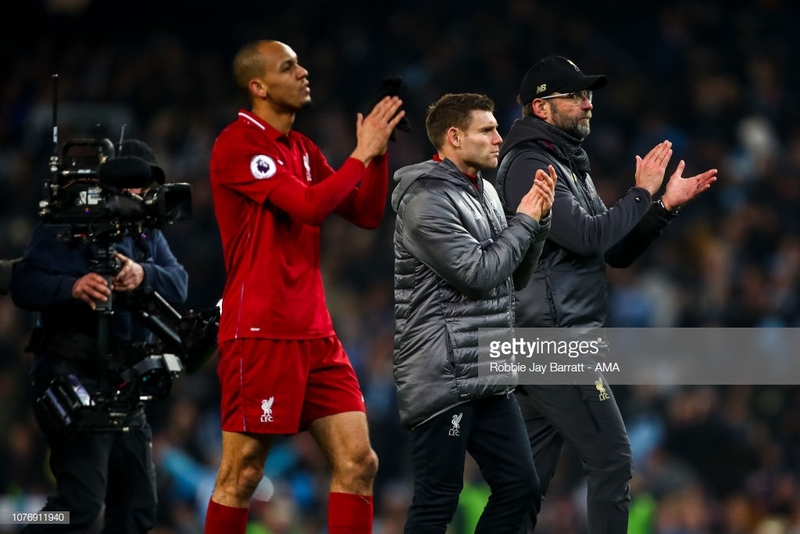 At that point, Liverpool were looking likely to set a record points total for a second-placed finish, such was the continuing dominance of the brilliant City side ahead of them. However, December saw City flounder and Liverpool surge not only to the top of the Premier League, but with such a good lead that defeat at the Etihad was far from the knockout blow many had anticipated it would be prior to the festive period. When Liverpool have not played great, they have managed to accumulate more points than when City have hit problems themselves, so despite Liverpool's patchy record in the bigger games this season, the remarkable consistency that the Reds have discovered has put them into a position all Liverpool fans would have taken at the start of January. What now for title-chasing Liverpool? One question remains – can Liverpool maintain their form, especially after suffering defeat? Liverpool’s team, and squad, is deep and talented enough to go on another long unbeaten run, which will be needed to hold off a resurgent City side. Recency bias ensured City were underestimated by pundits on Thursday – a complete contrast to the debate a few weeks ago about whether they could go unbeaten themselves or win the quadruple this season. City are far too good a side to give up a title without a fight which will in all likelihood go down to the wire. Normally Liverpool would love to challenge for the FA Cup and Champions League but all focus will be on ending a 29-year wait to bring the title to Anfield. The pressure of that alone could be enough to destabilize the Reds, so removing the unbeaten monkey off their backs may not be such a bad thing. It is only one defeat, Liverpool’s first of the Premier League, and to a side regarded by many as the best in the world and one of the best ever in modern English football. Confidence, not panic, should be surging through Liverpool’s players, who will be determined to prove that they have the character to be champions. After all, the title remains in their hands. The best of the best are those who stand up to be counted in the face of hardship, not just enjoying the good times but dealing with the bad as well. The Reds proved they could react to adversity within a game with a brilliant turnaround and eventual thrashing of Arsenal at Anfield last week. Now that reaction needs to stretch to the season as a whole, starting with a trip to Brighton when the title race resumes.